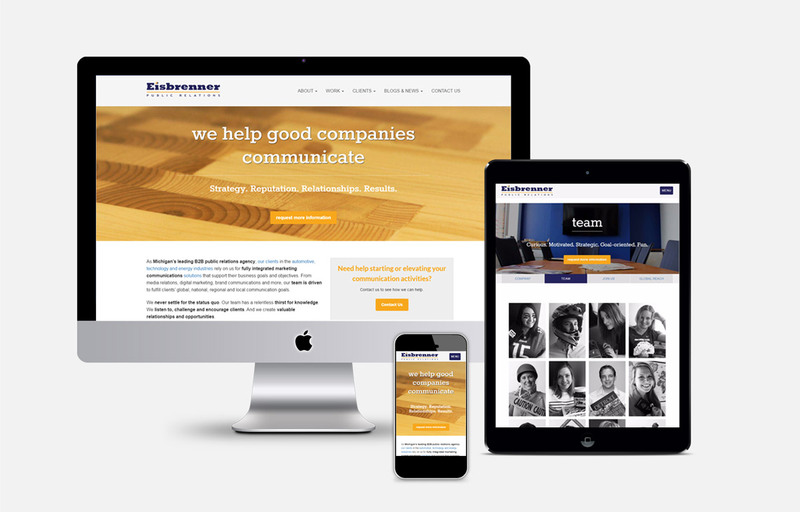 Eisbrenner Public Relations, a prominent PR firm in Royal Oak, Michigan needed a new website. We’ve worked for a long time with Eisbrenner, and they’ve been a great client, so we looked forward to working with them to design and develop a new website. Website should better represent the current business. There is outdated content, content that is hard to find, and the sites navigation was difficult to understand. Note the navigation in the screenshot below. It’s not clear what items are available under each of the tabs. The current site was clumsy to update. They could do updates through the WordPress administration, but it wasn’t simple, and some updates needed to be done by us, which wasn’t ideal for them. The website needed to display properly on various devices. The current website wasn’t responsive, so browsing the website was unfriendly for non-desktop users. Create a custom WordPress theme that better fits the website structure and business needs. We used one of our favorite WordPress plugins, Advanced Custom Fields, to enhance WordPress’s standard editor screens giving them a customized environment to add, edit and delete posts, pages and custom post types. They can now easily maintain team members, clients, news and their company and intern blog. The site was developed to be response, so the site displays well on all devices like mobile smart phones, tablets and desktop computers.